Isn't that Joe Breeze, Charlie Kelly? Rumpfy? Geoff? Noah? Margit? Rich? Nine riders gathered this morning under a chilly fog to ride the gentle swoopy trails built by the greatly beloved California State Park ranger, Patrick Robards. 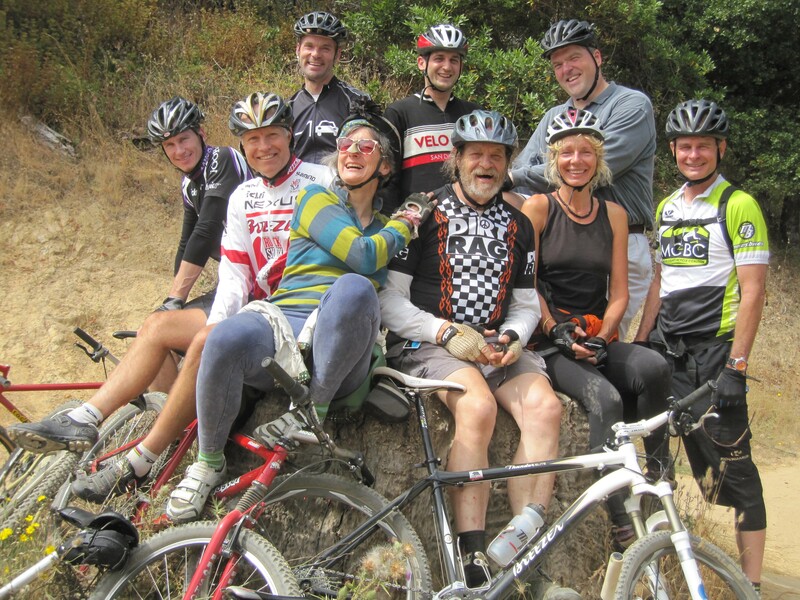 Robards was the first in the county to embrace the growing population of riders and create trails at China Camp that would be do-able, legal by any trail requirements, and fun. When the tree stump and the ‘tripod tree’ appeared halfway through the ride, I assembled a group shot. Margit P. was on her first ever ride on this part of China Camp, and Rich Belson, fresh from Vancouver and newly ensconced in Garlicland, had never ridden here. I get to aggravate my enthusiasm infection through the virgins. Scooter turned 55 today, I told him Ned turns the same age tomorrow and hinted that Mr. Cunningham was enjoying his birthday the day after that, in perfect peace and without fanfare. ~ by jacquiephelan on August 21, 2010. Richard came home with a happy face. I have a feeling we’ll be heading up there again and I hope it will be soon! Thanks for visiting my blog Jacquie! Ya’all have way too much fun seems to me; I’m envious! Wonderful group. Happy Birthday to CC on Monday. And it is outrageous the way business operates. The same attitude that lets them use up and discard people let’s them ignore the environment and regulations and results in gulf oil spills, Enron, Walmart, Monsanto etc. All in the name of profit for a few…. I hope CC has been able to move beyond it, for his sake. Was nothing but grins for me yesterday. Thanks for joining us for Noah’s introduction to Marin mountain biking. Good times! This is a pro forma response, generated by my computer without my knowledge. No reply is necessary.